The items below were ‘the cream’ of the articles and websites I found this past week. Click on the light green text to look at the article. Best of Mulitmedia 2016 – From The Scientist so most from the Life Sciences perspective. There is a display of infographics then links to the full stories. After that there are some videos. Quite a lot happened in 2016! How to draw PACH – I am so pleased with this pattern. Remember the paper chains that children enjoy making with strips of construction paper? I remember making them…my daughter made them too. This is a Zentangle® pattern to draw them! It’s a lot easier than I thought it would be. Happy Anniversary to Photo Ark! 10 Years, 6,300 Animals Photographed – The post is about Joel Sartore’s project to photograph the animals of Earth. Take a lot at the Photo Ark site as well! Pregnancy leads to changes in the mother’s brain – I think most women acknowledge that there is a change…initially thinking it is just the effect of sleep-deprivation….and later realizing that part of the change is still there after the baby is sleeping through the night. For me – it not only helped me into motherhood, it also enhanced my ability to empathize with others. That made me a better manager and leader at work. 10,000-Year-Old Turf War – Even hunter-gatherers fought other groups of hunter-gatherers. I’m still following up on articles the students in the Osteoarcheology course on Coursera are finding. Treasure Trove of Newly Discovered Species Includes a Newt that Looks Like a Klingon – My favorite is the first image (the Phuket horned tree agamid). Which one is yours? The strange effects of thinking healthy food is costlier – Evidently the health=expensive equation has a bigger impact on our perception (and purchasing) than objective evidence! Buying Experiences vs Buying Things – An infographic comparing spending choices (there is a link to expand the infographic…makes it readable). There are a lot of reasons that spending on experience adds to our happiness more than spending on things. What are the experiences of 2016 I’ll remember the most? The trip to New Mexico for the Festival of the Cranes tops the list for memorable travel. My husband and I enjoyed it so much we’re already looking for similar events at National Wildlife Refuges elsewhere in the country. My son-in-law defending his research and getting his PhD…finding a postdoc for 2017…tops the list for memorable family event. It’s quite a milestone. My daughter will have a similar one in 2017. This kind of milestone is a huge change for them --- no longer a student, physically moving somewhere very different, etc. --- and has the potential to be a pivot point in their lives. It’s on my list for memorable experiences because of the flurry of activity we’re involved in these last weeks of the year…and knowing that there is more to come in early 2017. Of course – there are many other things I could put on the list – courses, volunteering, travels to familiar places. I chose these two because they were so different...they are not part of the ‘norm’ that we enjoy all the time! I thoroughly enjoyed a 2-day class on aquatic macroinvertebrates last week. It’s been almost two years since I too anything that was more than a few hours in duration….and a long time since I had been in a lab. I celebrated the subject matter and the experience that reminded me a lot of my undergraduate days. 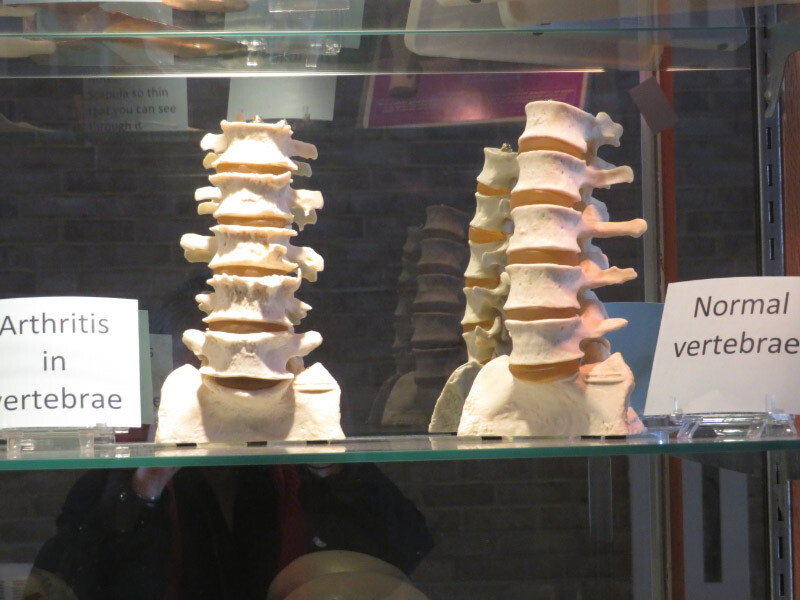 There are two Coursera courses that I celebrated – linearly since I was not taking them concurrently: Osteoarcheology and Anatomy of the Abdomen and Pelvis. They are probably among the most challenging Coursera courses I’ve taken…but I’m so interested in the topics that I’m celebrating their availability and that I have the time to dedicate to them. I made the Paleo Chocolate Pudding (made with avocado!) and wow! I’ll make it again as part of our celebration at the beginning of 2017. I heard an owl in the forest behind out house just before it was light enough to see it…and celebrated knowing it was there. A red-tailed hawk visited our backyard again. 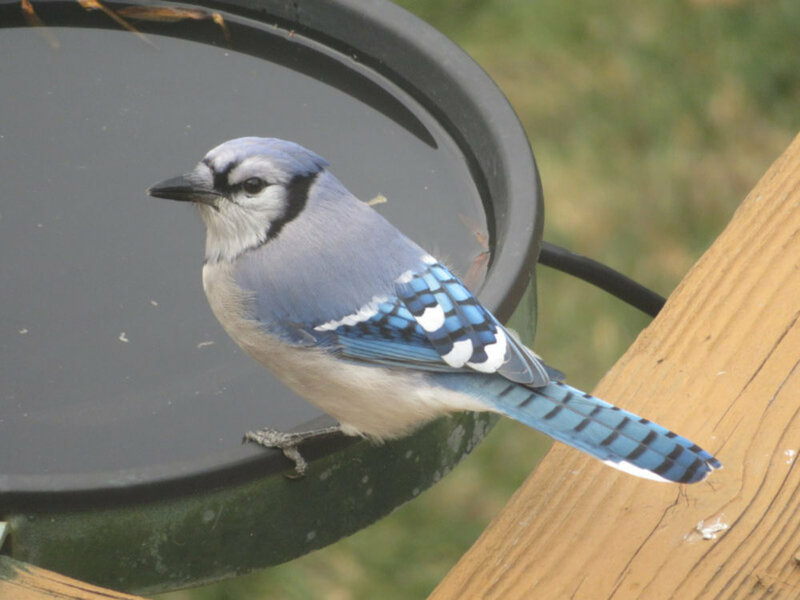 I celebrated that it did…and that it didn’t stick around long enough to scare away the birds that visit bird bath and feeder. The most Christmasy items on the list of little celebrations are a walk around Brookside Gardens’ holiday lights and the poinsettia display at Rawlings Observatory. And I always celebrate seeing Bald Eagles at Conwingo. The birds – rare not so long ago – are back in large enough numbers that it’s possible to seem them often. Something to celebrate! And two very sleepy cats. I like the zoom on my new camera! Scrapbook of Victorian Greeting Cards. Handwritten date of 1874. Available from Internet Archive here. I focused on the Christmas cards because – after all – it is December. Styles have changed considerably! This one of a child blowing soap bubbles – with a pipe held upside down…and, evidently, indoors – was one of my favorites. Gordan, Elizabeth; Ray, John. Buddy Jim. New York: P.F. Volland Company. 1922. Available from Hathi Trust here. I looked at everything the Internet Archive and Hathi Trust had with John Rae illustrations. I liked this one because of its depiction of outdoor experiences of a child in the 1920s. How many children today spend this much time outdoors? Wolle, Francis. Diatomacae of North America. Bethlehem, PA: The Comenius Press. 1894. Available from Hathi Trust here. The drawings in this volume – over 2300 of them – from over 100 years ago prompted me to think about a photography project this spring (diatoms) and some Zentangle patterns. It was quite a visual feast! Yesterday we spent the morning at Conowingo Fisherman’s Park. It was a sunny morning – Christmas – and the traffic was light. 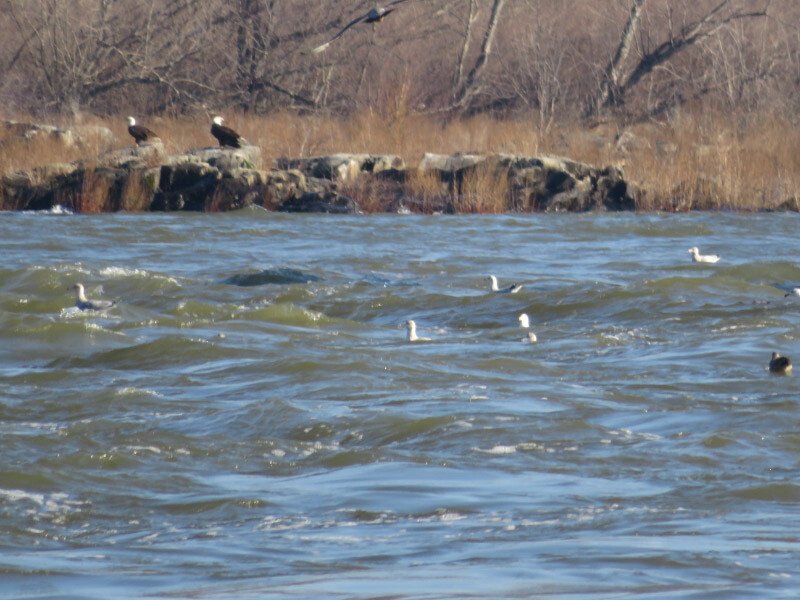 When we got there we immediately noticed that there were more gulls than we’d seen before and the water was churning from the dam. It takes us about an hour to get to Conowingo from our house so we had not put on all our winter gear beforehand. I added ski bibs, a fleece jacket, a silky balaclava, and a hooded scarf before I put on my coat. Foot warmers were added to the bottom of my feet before I put on my hiking boots and I stuck hand warmers in my gloves. At the last minute, I decided to add the bands the legs of the ski bibs to shorten them a little since the pavement was slushy and wet. The temperature was in the 30s…a good but not severe test of the ‘cold weather’ garb. I stayed comfortably warm! The silky balaclava is newest addition and I like it because it easily pulls up over my mouth…are higher over my nose; That would be great for colder or windier days. You can also see that we were not the only ones enjoying the birds at Conowingo on Christmas morning! The Bald Eagles are the reason we go to Conwingo. My husband got the best pictures of the day of an eagle that had just caught a fish. He also took a picture of one up in a tulip poplar tree that we noticed as we talked back to our car getting ready to leave. I took some pictures that are past the optical zoom range of my camera…into the digital zoom. There were almost always eagles on the abutment come out from the dam and I couldn’t resist trying to capture their interactions. The one on the left is keeping a firm hold on his catch. Is this one screaming at the gulls to go away? And sometimes there is just a big tussle. There are at least three birds involved in this picture. This eagle is surrounded by black vultures – although they all seem to be not making eye contact with each other. There were groups of black vultures on the railing at the top of the dam…and there always seemed to be one or two that were spreading their wings. I saw one cormorant in the water…and one flying low over the water. The gulls were ring-billed gulls. They would dive down to catch a fish then (sometimes) bob downstream on the surface. Now for some ‘can you find’ pictures. There is a great blue heron in each of the three pictures below (not flying). Do you see the pigeons in the picture below? And finally – do you see the two Bald Eagles? Conowingo was a good outing for our Christmas morning! We are having a quiet Christmas – guests and travel happening later this week. I bought some flowers for the table…and to photograph. It was a good project for the cold days leading up to the holiday. Since the weather cooperated this morning (sunny) – we are going up to see the Bald Eagles at Conowingo Dam– bundled up in our winter gear and hoping to get some good pictures. I’ll take a Thermos of hot Plantation Mint Tea to help me warm up from the inside. It’s the first time we’ve done anything like this on Christmas morning. Skeleton Lake of Roopkund, India – The lake is in the Himalayas and covered with ice for most of the year. Researchers think that the 200 people were killed by a sudden hail storm – with hailstones up to 9 inches in circumference. Heading off Headaches – I am fortunate to not have headaches very often. When I look at some of the preventative steps listed in the article…most of them are part of the way I live all the time. Skeleton found in Clare cave reveal a tragic life story – The skeleton found in a cave was analyzed and found to be a boy 14-16 years old at time of his death in mid-1600s. He had endured near starvation conditions for all his life. The space he was found in was just large enough to crawl into…and I wondered if he intentionally went to the cave to be alone when he died. The Chemistry of LED Lights – We are seeing so many LED lights in Christmas displays. Here’s the tech details behind the brilliance. Skin proteins reveal how mummies died – Three mummies analyzed. Based on the proteins found, one might have died of tuberculosis and another from pancreatic cancer. The third one had been interred in a hollowed out log and exposed to the elements over time; the proteins had degraded and could not be identified for that one. An Unlikely Renaissance of Appalachian Elk – Outside Grundy, VA – in a former surface coal mine, now grass covered…a place for reintroducing elk to the east coast. There are places in Kentucky and Great Smoky Mountains National Park too! Raw foodies: Europe’s earliest humans did not use fire – An analysis of dental plaque from 1,2 million old skeletons shows they were eating meat and plants….raw. There was no indication of charred fibers or of microcharcoal. Top Technical Advances 2016 – From The Scientist Magazine – so skewed to biological sciences. The Challenge of defining maturity when the brain never stops changing – “The age of 18 doesn’t have any biological magic to it.” The concept of maturity links to responsibility for actions…an important concept in our legal system. I buy pomegranates almost once a week during their season. 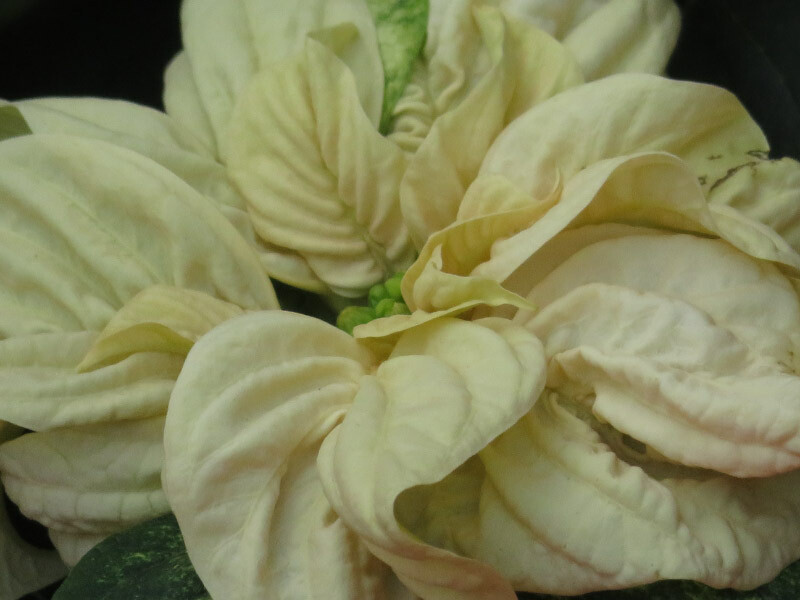 Their deep red color and the shape of the seeds are the ‘jewel food’ for the holiday. Of course, getting the seeds out of the peel and membrane is the challenge. I cut the outer peeling and pull the halves apart --- then beat the peeling over a large bowl causing the seeds to fall it. It works well although there are still some splatters that escape over the rim of the bowl. The process is more like ‘play’ than food preparation! Since the natural world is pretty drab this time of year – the bright colored foods are on my ‘favorites’ list. I like to make chicken salad with broccoli and cranberries (although I still include the celery that I usually use during the summer too). I also like to stock up on homemade dried orange peel this time of year – to add to soups or stir fries….or to package up to give as a Christmas present! Have a small plate on the counter all during the month has just become part of my Christmas tradition. December has been a good month for bird observation through my office window. 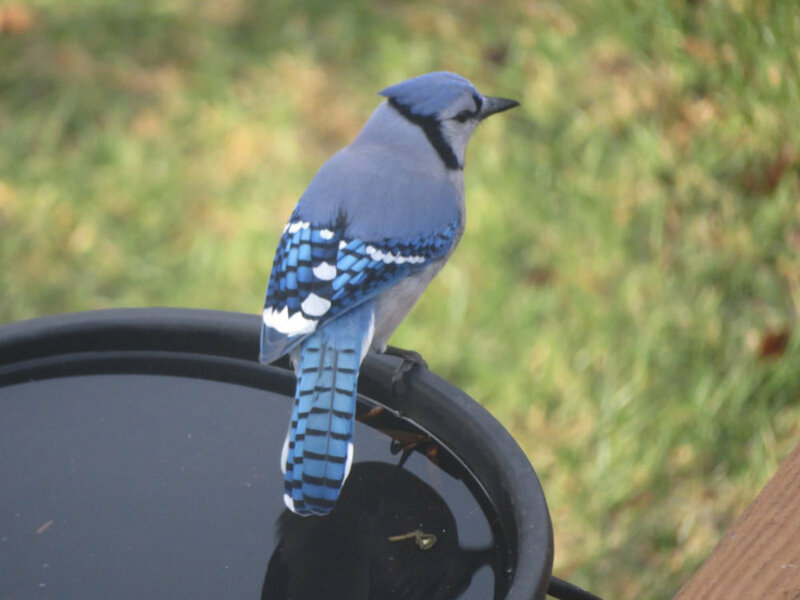 Our bird bath is particularly popular with blue jays. Note the change from the blue-green bowl early in the month to the heated bowl. I’m not sure whether the blue jays are the most frequent visitors, but they are certainly the noisiest. Both the male and female cardinal stop by almost every day. They make small noises so I usually notice then too. 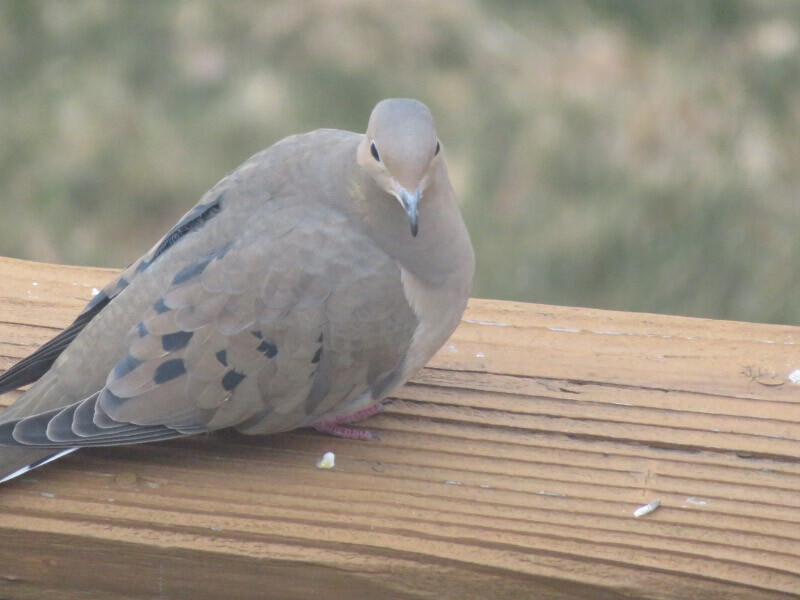 The mourning doves are quiet…but they are big enough to catch my eye as they swoop down to the deck railing. All the other birds hide when the red-tailed hawk flies in to perch in the trees at the forest’s edge behind out house. I like to see raptors, but am glad they are not watching my deck all the time! 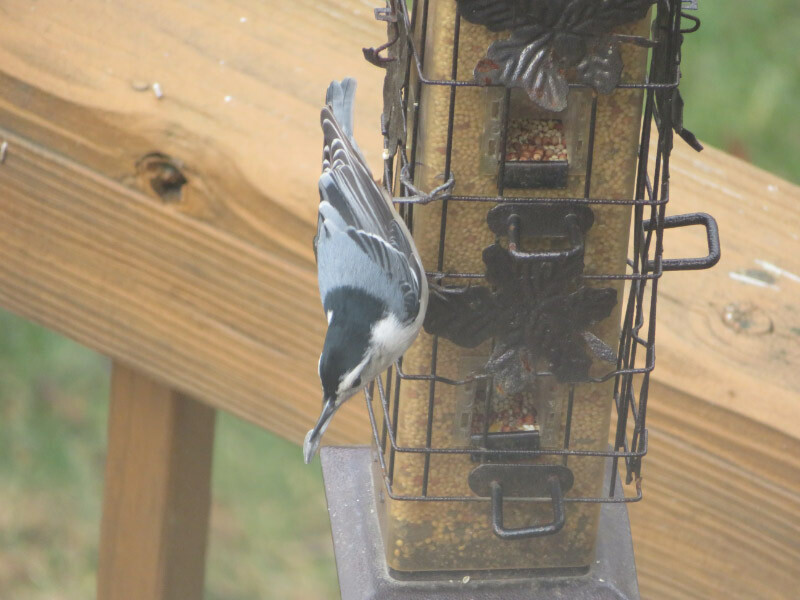 A white breasted nuthatch visited the bird feeder and did the usual upside down acrobatics to pick out individual seeds. I saw the Northern Flicker (yellow shafted) – just as I did in November; the bird likes the maple. The yellow on the wing and underneath the tail was clearer in the photograph this month. The juncos can be aggressive and chase off some of the other birds. The winter here…a long way from where they have their young in the arctic. I wonder what will happen to their numbers as the arctic warms. They are high energy birds all winter long in Maryland. There are some birds that I see less often (because of the swarms of juncos). I saw a sleepy looking male goldfinch in winter plumage. 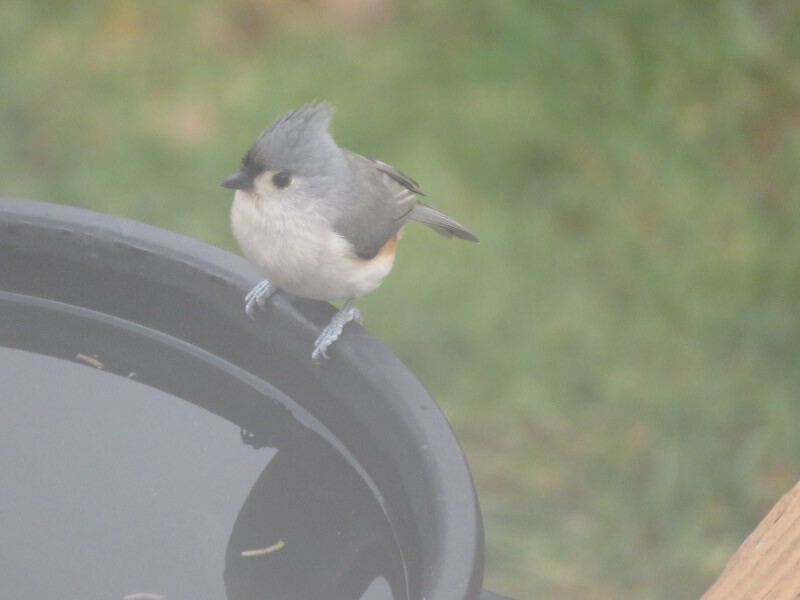 A titmouse got a quick sip at the bird bath before a junco flew in. The Carolina wren is still around to but tends to stay clear when the juncos are around. The bird is not a noisy in the winter as when defending territory in the spring and summer. I’m enjoying the birds of winter! The community college in the neighboring county hosted a Freshwater Benthic Macroinvertebrate Workshop on Monday and Tuesday this week. It was two full days of day of taking small critters (preserved in alcohol) out of vials, putting them in a small Petri dish, and looking at them under a microscope. There were two lab rooms full of student – most teachers or Master Naturalists or environment monitoring related non-profits or government organizations. I’d signed up as soon as I heard about it….a great opportunity to see a lot of specimens and improve my ability to identify them for upcoming field trips with students in the spring. It’s been a long time since I was in a lab like this – since the 70s! I liked that there were actual chairs with backs rather than stools. I can remember classes held in labs and being very uncomfortable both from the hardness of the seat and not being able to lean back at all. We also had a microscope for every student; when I was in school we always had to share. Some of the things I saw, I won’t see on the field trips because we don’t have enough magnification: oval shaped gills (easily detached when preserved) or comb-like spines (that look like false eyelashes) that distinguish certain families of mayflies (Ephemeroptera). I learned about Macroinvertbrates.org and am looking forward to seeing its continued development. The family-level key we used in class is also online. Generally, we only classify to order on the field trips. In the foyer of the building – where we registered and a table was filled with morning caffeine urns...and donuts that called all of us to jettison our diets…there was a display case of bones, which dovetailed nicely with the osteoarcheology class I just finished on Coursera. There were pathologies (like arthritis) and young bones (with the defined areas near the ends where growth was occurring). I enjoyed the course tremendously and have signed up for another anatomy related course from the same university. I seem to be focused on biology related topics this December! And, this year, filling and surrounding a donkey cart. There are pinks and reds and white and white/red combinations. 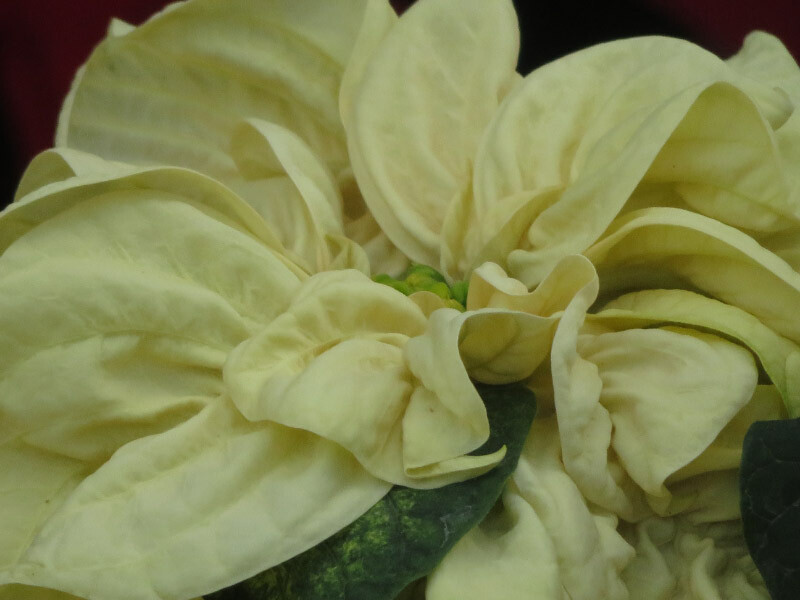 The one that looked most different to me this year was an off-white variety that has smaller flowers but lots of curly petals that almost covered the center. I also looked for the green veined white leaves or petals – not sure which one they were. I saved this ‘part’ to post about until last….since it was the most Christmasy….we’re getting closer every day. Previous posts about the Rawlings Conservatory: Cactus Room, Tropical Room. I posted about the cactus room at the Rawlings Conservatory last week. Today it about the experience of the tropics room. It a warm moist place – perfect for a change of environment on a cold blustery winter day. It’s not only the temperature and humidity that is different from the outdoors. It’s the colors of the foliage. 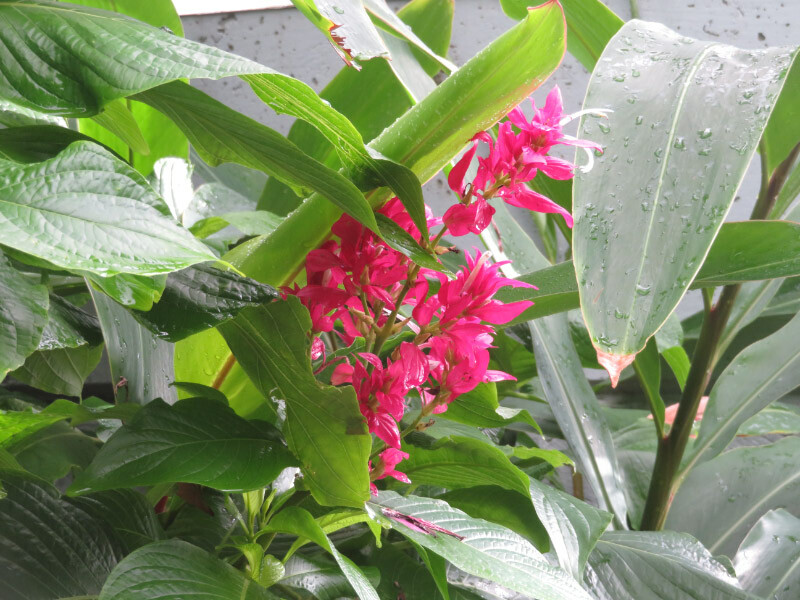 Everything outside has faded to winter drabness here – while the tropical room is full of color – dominated by green. There were only a few things in bloom and I focused on them for my photography. My favorite memory of the room was not about the place itself but a mother with a young child (probably 6-12 months old) in a stroller. I commented that her child really seemed to be enjoying the green – wide eyed and alert. What followed was a very pleasant conversation about how different life is when not constrained by a career based schedule. She had stopped working when her child was born and did not plan to return for a couple of years…and I retired. We’re both enjoying this time of our lives and the choices we’ve made to fill our days. The little girl in the stroller seemed to enjoy listening to us talk too! The tropical room was the part of the Rawlings Conservatory that reminded me the most of the Brookside Conservatory. It has similar plants (like the Bird-of-Paradise below). One difference: the water feature at the Rawlings Conservatory has a water feature that is deep enough that it is stocked with goldfish and there is a dispenser where you can purchase fish food. 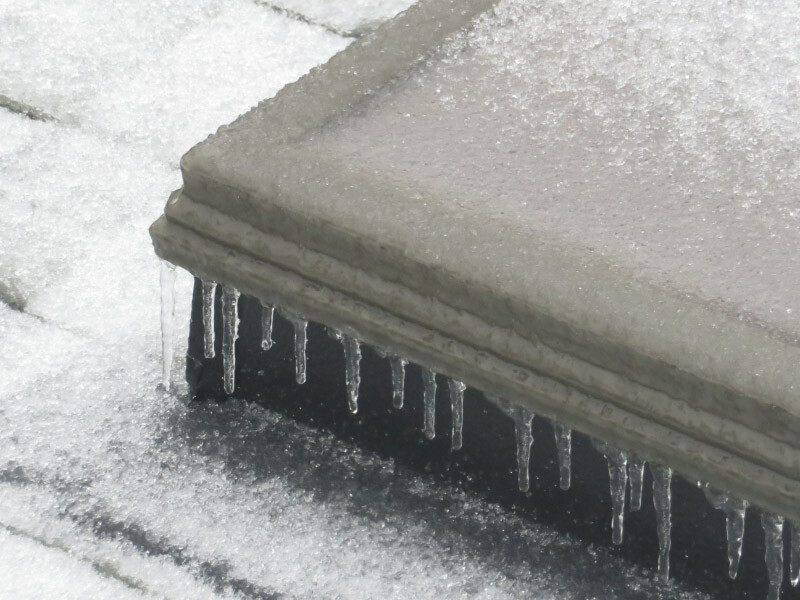 And the skylight on the covered part of our deck was covered with a layer of ice and fringed with small icicles. Ice coated vegetation too. A small limb on one of our trees broke as I watched. There might be others that have split that will require trimming next spring. The pine branches are leaning – looking like giant bottle brushes – but will straighten as the ice melts. 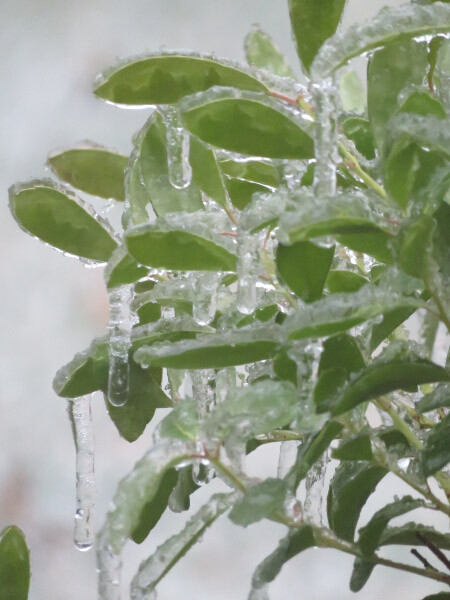 The evergreen bushes caught water on their leaves that froze as it dripped off – a mini-cascade. The azalea bush outside our front door is my favorite with its reddish leaves turned to cups for ice – overflowing. Later in the day, the temperature climbed above freezing and much of the ice melted enough to fall from the trees. This was not an event that lingered! Ceiling panel cools regardless of climate – I like to read stories about ‘out of the box’ solutions…although I wonder how many of them will prove feasible in the end. Big Pharma and Distracted Driving are Killing Americans Early – Life expectancy in the US declined in 2015. It’s the first time in 23 years. It’s not a big drop but there is worry that it begins a downward trend. Deaths due to motor vehicle accidents have gone up by 6%. Accidental poisonings increased by 13% with 95% of that from drug overdoses and alcohol. There is related story – from another source: American Death Rate from Drugs, Alcohol, and Mental Disorders Nearly Triples since 1980. Toward Treating Alzheimer’s Disease with Brain Waves – Another ‘out of the box’ solution…inducing gamma (brain) waves using optogenetics…exposure to flickering light. “Neural Tourniquet” Zaps a Nerve to Stop Bleeding Anywhere in the Body – An example of bioelectronic medicine…that’s been researched for 15 years. World Map Reveals What Each Country Does Better than Any Other – I’m not sure how useful this work is…how the ‘best’ about a country was determined. But it is interested to look at ti for a few minutes. The US is best at ‘spam emails’ --- not a positive thing. Museum in Japan has a collection of 1,700 rocks that look like human faces – I remember ‘seeing’ faces in the patterns of wood veneer…why not rocks too. Some of them look more face-like than others to me. The appalling reality of Bosnia’s missing dead – Mass graves from 25 years ago – a sad reminder of tragedy that is hard to unravel from what remains. Reach Out Reporter – Science News for Children – Free Technology for Teachers post and actual site – There is ‘Fact Pack’ about the December Solstice that links to this time of year…I like the video about starling murmurations! The site is designed for teachers…but is useful for anyone interacting with children on science related topics. A few new maps in National Park Maps – A great site to check before you head out to any of the national parks! 10 Intentional Deformed Skulls from Around the World – I’m taking a Osteoarcheology course on Coursera right now and am reading the articles other students are referencing. Expect more items on the gleanings for next week too. Earlier this week, my husband and I made the trek from our house up to the Rawlings Conservatory in Baltimore. We had seen it in passing 15-20 years ago when we were making trips to the Baltimore Zoo when our daughter was young – but we had never stopped and gone inside. It’s not as big as the Longwood Conservatives and is probably about a 100 years older than the Brookside Gardens Conservatories. It was a morning well spent. 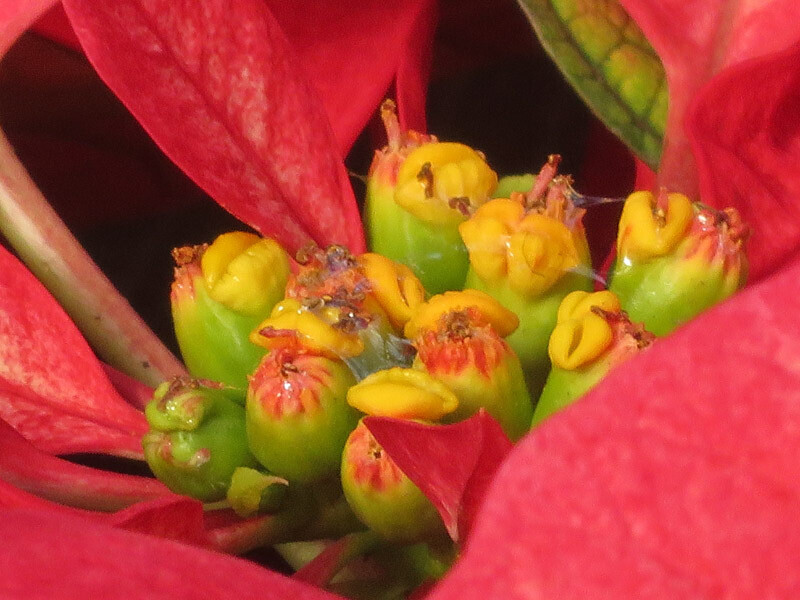 This post is about the desert room of the Conservatory and will be followed (eventually) by two more posts about the tropical room and the poinsettias. There was an aloe in bloom. The color attracted my attention at first. 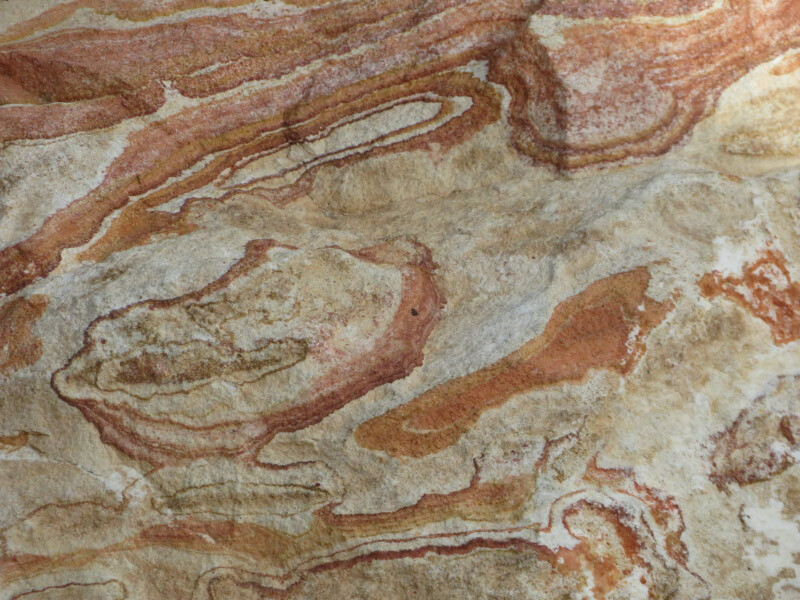 When I zoomed in for a closer look – the coloring became even more distinctive. Periodically some rocks with rusty swirls were positioned among the cactus…adding other colors to the room. It reminded me of looking down on the terrain of some of the western US from an airplane window. 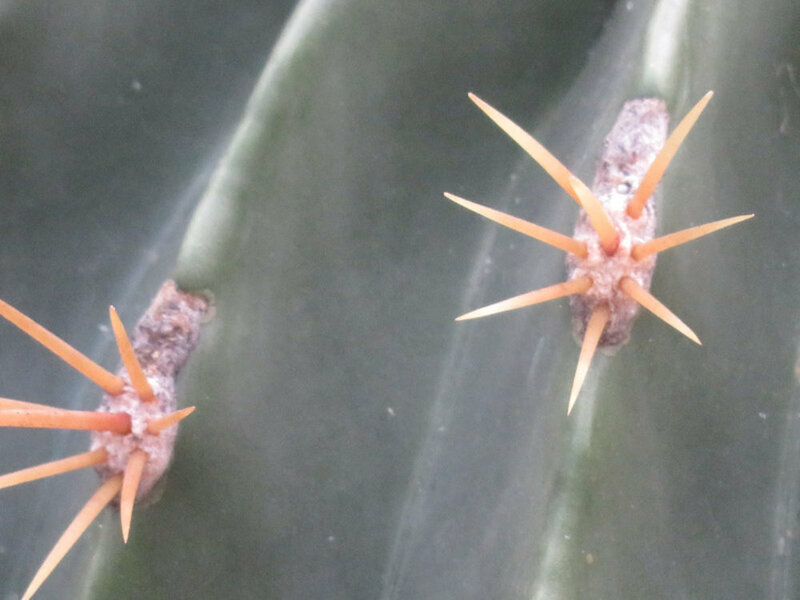 There was a tiny clump of cactus with seed pods about 1/4 inch across nestled in the spines. There were two elderly women that spotted them and made sure I saw them. And then I continued my project photographing cactus spines. There were some different types than I had photographed before. They all look so different from other plants...fodder for science fiction writers imaging aliens. When I walked into my office yesterday, the moon was lighting up the room. It was moving down into the treetops to the west of our house. What perfect timing! I managed a few pictures…then continued with my normal routine of eating breakfast and checking the news feeds on my big monitor. As I took my breakfast dishes back downstairs, I noticed that the east was photogenic at that very moment! I hurriedly put my dishes in the kitchen and ran back upstairs for my camera. It was about 10 minutes before sunrise…so the pinks dominate the oranges and yellows – particularly in the contrails. There are a lot of flights out of Baltimore in the early morning so if the conditions are ‘right’ for contrails to form, there are a lot of them. I went back for a second look later to see if the blob at the end of the foreground tree branches (it’s the oak in our front yard) was a bird or a leaf….it’s a leaf! I took a walk around our neighborhood this past week to try out my new ski bibs; I’d purchased them when we got home from New Mexico where my legs got very cold on some of our early mornings and I wanted to see that they worked before our next trek up to Conwingo to see the Bald Eagles. They – along with my long standing cold weather gear – kept be very comfortable even though the temperature on the day of my walk was in the 20s. They were very comfortable for walking/hiking too. The neighborhood was so full of color just a few weeks ago – the memory of its brilliance still so fresh – that if found myself searching for anything that was drab winter colors. 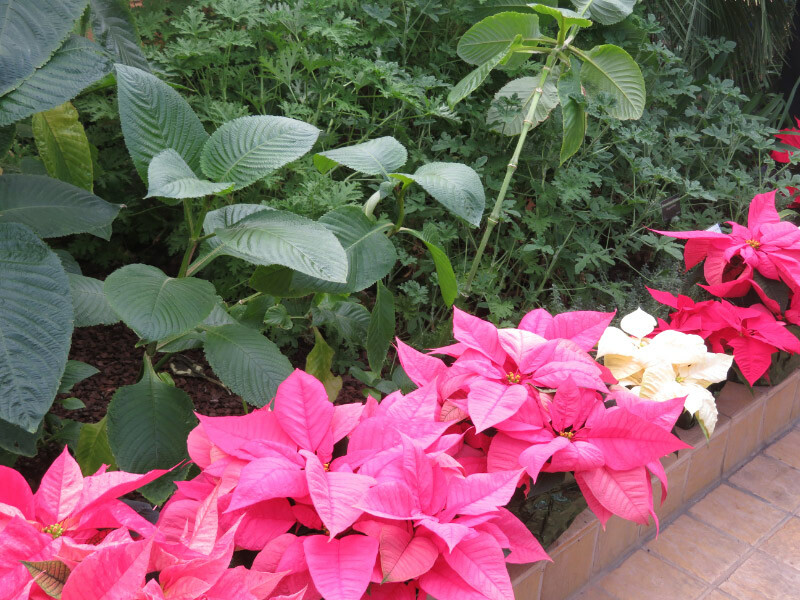 There were Christmas decoration, of course, but I was more interested in seeing color in the vegetation. I found a stand of Callery Pear saplings (i.e. escaped Bradford Pears) in an area that is not mowed behind the water retention pond. They were catching the morning sun and were brilliantly orange. I admired them even knowing that I shouldn’t like them because they are invasive and will crowd out plants we may need (in prior years this area was the best place to find milkweed in the neighborhood and the Monarch butterflies need that to survive). The pond itself is typical of many in our area. The maintenance crews mow the slopes very short and they erode. In the case of our pond, the grass if very thin in some areas and there are beginning to be bare spots where there is no vegetation at all. Some moles or ground hogs or chipmunks have made tunnels on some parts of the slope and several have collapsed. There are cat tails and a willow at the edge of the pond. It seemed like both were a little further out of the water than I remembered. The pond is filling in. The cattails did not offer any color relief but I like the texture of the ‘tails’ – the brown velvet and lighter color of the fluffy seeds. As I walked back through the neighborhood, I realized that the distance seemed shorter than it usually does so I must have been very comfortable in my winter walking gear! 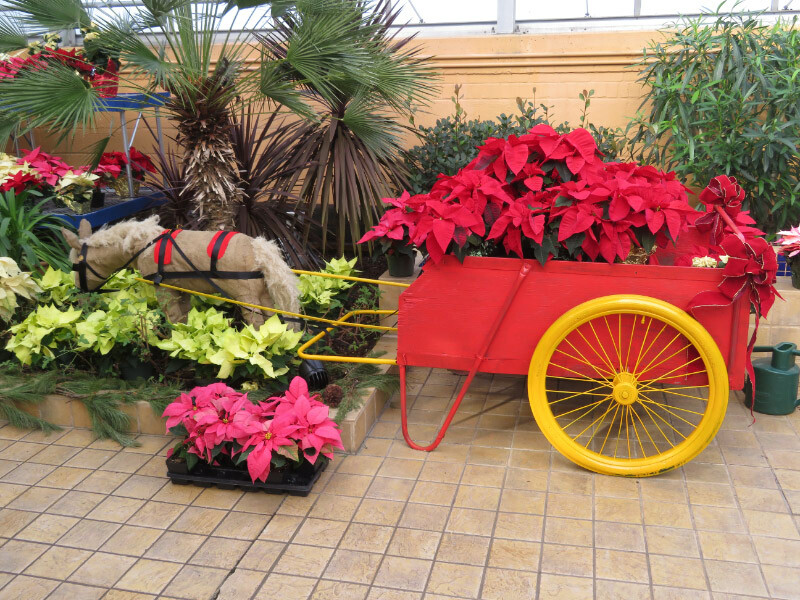 The conservatories at Brookside Gardens held more than model trains when I went last week. 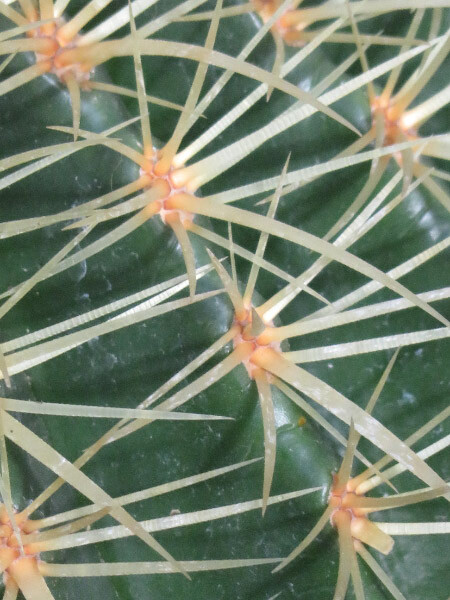 I was drawn to the cactus and took some macro shots of spines – like the ones I took at Bosque del Apache. 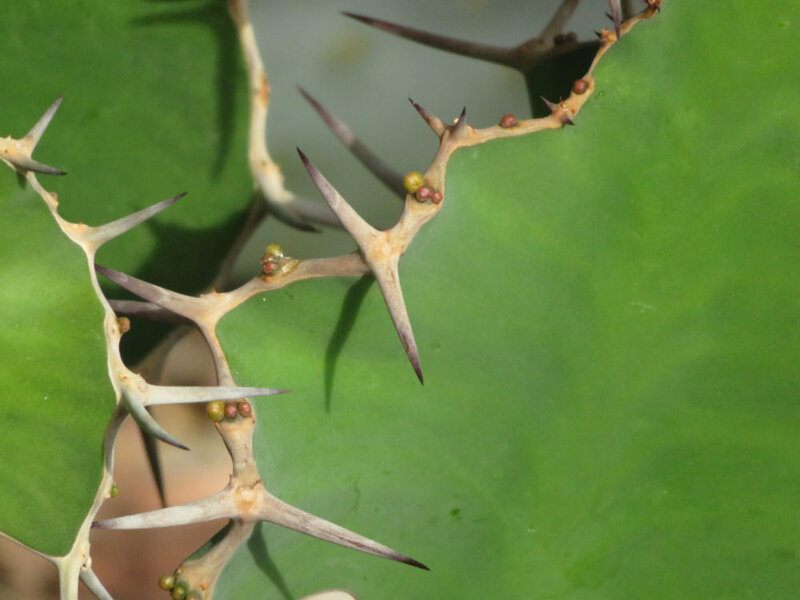 The Castor-Bean Begonia (Begonia ricinifolia) and prompted me to research differences between spines and thorns. I checked the Wikipedia article on the topic. I discovered there are prickles and other semantics. Did you know that roses have prickles – not thorns? True thorns are modified branches or stems…so these red things on the Caster-Bean Magnolia are probably not thorns. But are they prickles? Maybe. The larger ones seem to be split into hair-like structures but the smaller one are barbs. I didn’t touch the plant to find out how sharp they were! This time of year, it is easy to photograph a sunrise. I stopped in the turnout before the gate to Gorman Produce Farm (the Community Supported Agriculture farm I enjoy in the summer and fall) on my way to the grocery store last week. There were no clouds in the sky to reflect the light but the silhouettes of the trees and the shadowy buildings were enough to hold my interest. I enjoyed the scene and thought about how the CSA has modified my shopping habits even when I’m buying my produce from the grocery store – some pleasant thoughts on a winter morning. The temperature was in the 20s. I took a few pictures and continued to the store. I’ll try again next week when I am on the same errand. It will be a little a few minutes later. I’ll check the exact sunrise time for my location and adjust the time I leave the house just as I did for this picture. When I got home – I already had my little celebration for the day to record (i.e. the sunrise over Gorman Farm).